Welcome to week 6 of the 52-week MFRW blog challenge. Each week we have a topic. This week’s prompt is…My hobby is … When I’m not writing. 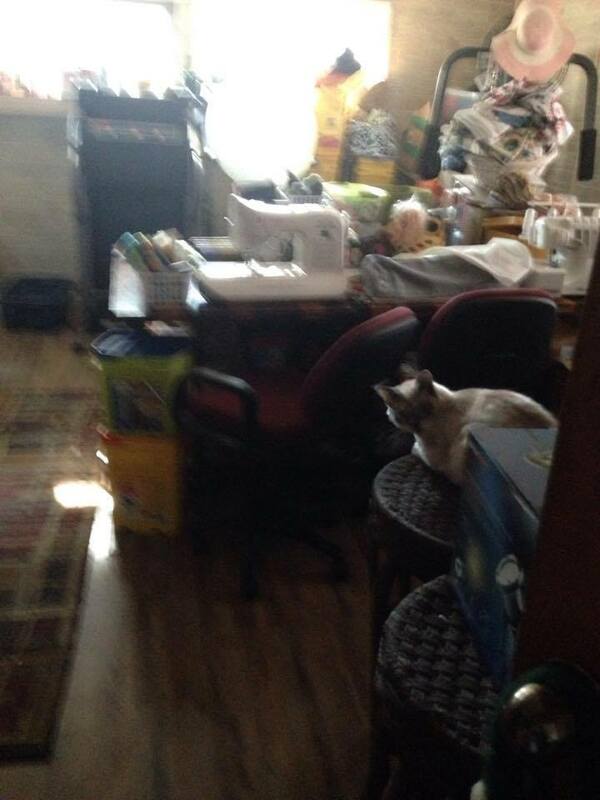 I am not a hoarder.. nope I’m sticking to it… I am a recycler and crafter. I see beauty in all things trash… well not all things but most. I use to throw it all in trash bags in a closet in my hall until I had the perfect project or time to make something with it. Of course, then I could never find what I was looking for. 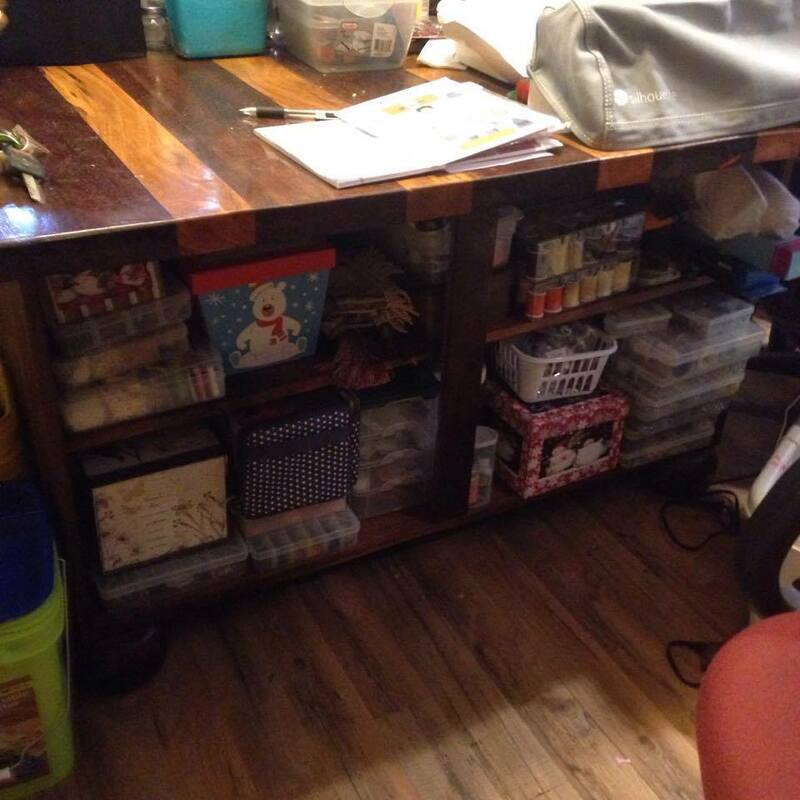 When we remodeled, a craft room was on my wish list. My husband took the old back porch we never used, enlarged it and made me a combo craft/ exercise room. He also made me the perfect work table as well. The table is big enough for my sewing machine, serger and cameo to sit out all the time and still have room to work. It is also big enough to cut out fabric on. I use the kitty litter in the big yellow buckets leaving me buckets I can’t seem to toss as well. When I had to unpack that closet, we tore out for the remodel I came up with a way to reduce my hoarding and organize as well. It also uses up those buckets. ( I knew they would come in handy and save me money on tubs!) I marked each one with the items I collect such as plastic creamer bottles, Jars, you get the Idea. 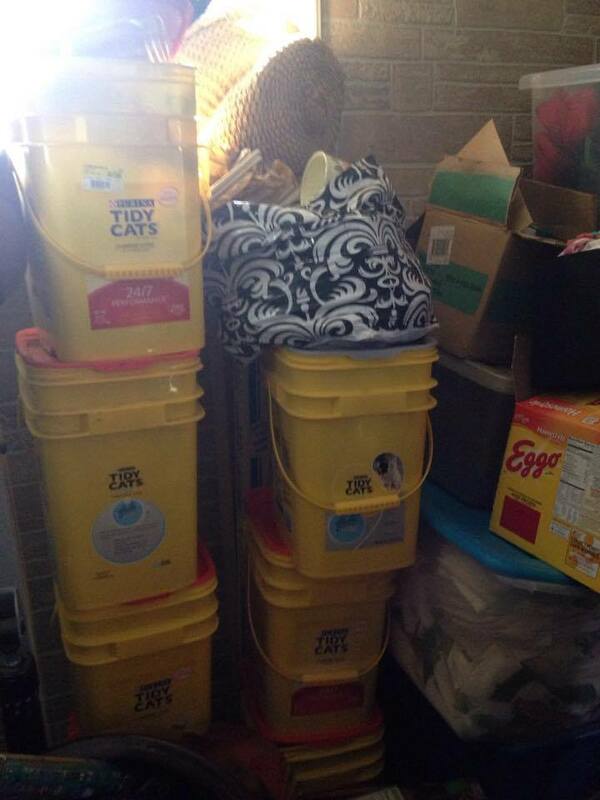 When each bucket is stuffed full, I can’t keep more of that item until I use some out of the bucket. The buckets stack neatly behind my exercise equipment. I also have my craft supplies. I have those plastic drawers I keep those in. Sewing and Crochet are my favorite hobbies. I collect dolls of all sorts and like to sew for them, I am starting a craft page and website to sell my goodies on in the next couple of months. I can’t throw away old clothes since I see projects. I have tubs of jeans, t-shirts, assorted sweaters. Same rules apply. These tubs get full I have to let go the others. I have plenty things planned. I have a set of placements cut out already. I have tons of fabric as well and yarn. I finally got that all sorted and organized as well. So as you see I have lots of hobbies besides writing. Do you have any hobbies? Don’t forget this is a blog hop. Anyone can join at any point in the MFRW 52 week challenge… Click here. Let’s go check out the other authors and see what their hobbies are! Hobbies: When Do I find Time? Wow! You are a serious arts and crafts person. 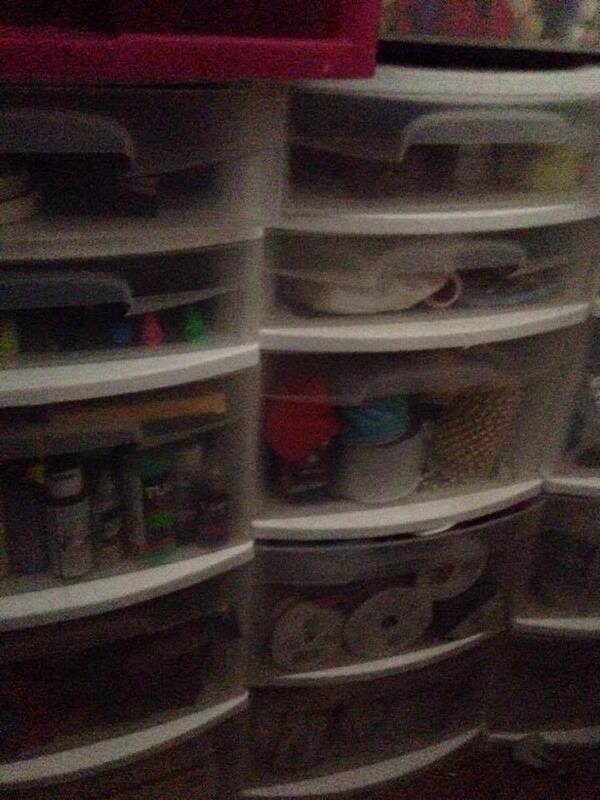 Your pictures reminded me of a dear friend who had all her sewing and craft items organized like you. At least, you can make your own gifts and make stuff for crafts shows. That’s cool! Thank yu for stopping by Patricia. And I never get bored LOL! Great post! We have similar hobbies. I need to get mine organized like yours though. Maybe then I wouldn’t be tempted to wholesale throw everything out and start over. I had that problem before it was organized. It was too hard to dig so I just bought new. Yay for having a craft room. It’s nice your husband created you a space and you found a way to keep it all neatly organized. In theory I wanted to be a ‘craft’ mom, but it just never worked out for me. LOL The closest I got was during my years as a Girl Scout leader. I wish my craft supplies were as organized. They share a space with four file cabinets full or records; printer and office supplies. I think the crafts are intimidated. They hide in a few tubs in the closet unless I pull out one project at a time, and when completed it goes into a sale bin. My goal? To have all the supply bins turned into sales bins. Reality of the dream? We’ll have to see. Happy Crafting. I would have killed for a craft room like that twenty years ago. LOL Congratulations! Thank you Heather! I coulda used one back then too! 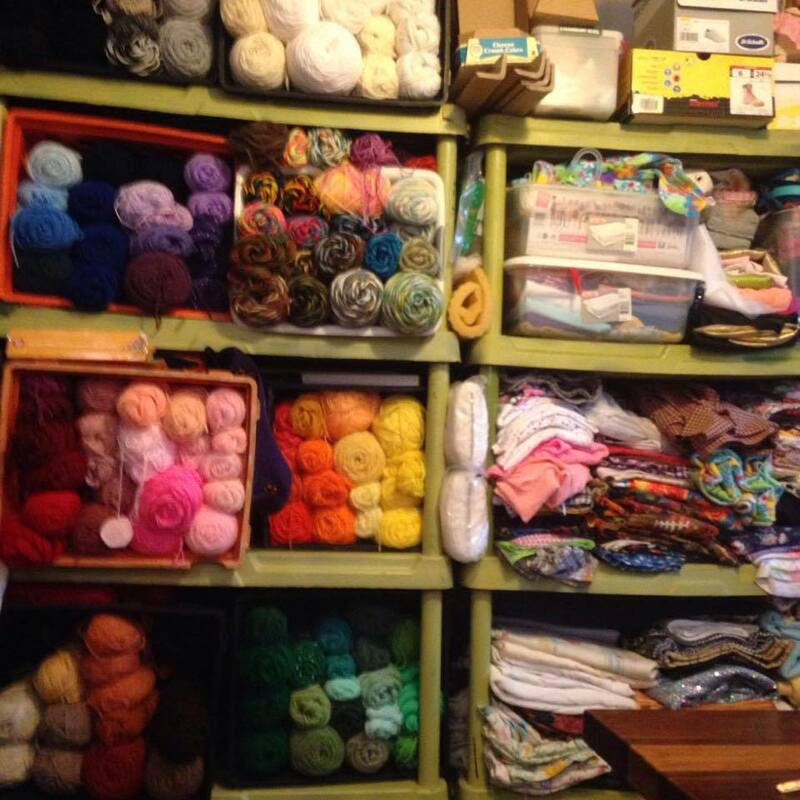 You’re lucky to have a craft room (and an organized one, at that). I don’t have time for crafts now, but I still have things stuffed in various closets for the day i DO have time, if it ever comes! Keep on crafting! You bet it’s crafts, and I am so envious of how wonderfully you have all that set up.